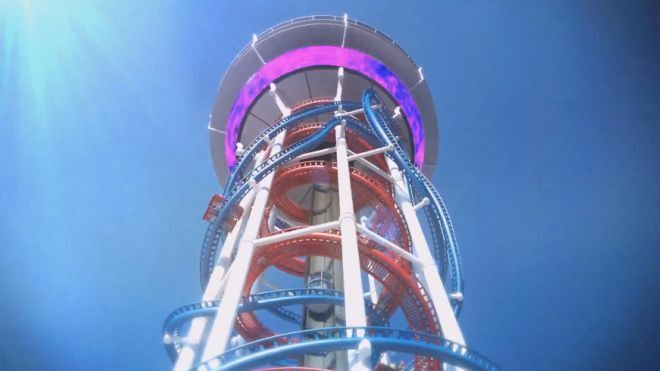 Officials revealed that the ride will be named Skyscraper and will be the centerpiece of a $200 million complex called The Skyplex at International Drive and Sand Lake Road. Joshua Wallack, the owner of Mango’s Tropical Café that have licensed the rights to the Polarcoaster attractions, announced that the construction is planned to start next year and the vertical coaster is slated to open in 2016. Riders will speed inverted down the outside of a tower at 65 mph from a height of 570 feet with no windshield. The coaster cars will hold 8 passengers and the ride will last about 3 minutes on a very long track at nearly 5,200 feet. The coaster will accommodate 1,000 thrill seekers per hour. The attraction will feature a 55-floor glass elevator that will take guests to an observation deck. The top of the tower will be two levels. A restaurant that will convert to a nightclub in the evening and an observation deck will be located there. The 495,000-square-foot Skyplex is expected to be visited by 59 million tourists per year and to create more than 500 jobs.